This musical legend has left many inspirational words of wisdom from his all too short life. 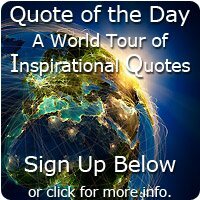 I hope you enjoy this collection of Bob Marley quotes. Bob Marley was the guitarist and lead singer of The Wailers. He also helped to bring Jamaican music and the Rastafari movement to the worlds attention. In Dec 1976 two days before a free concert, he was shot in his home in Jamaica, in what was a politically motivated attack. He took to the stage and performed, despite his wounds. When asked why, he said "The people who are trying to make this world worse aren't taking a day off. How can I?" In 1977, Marley was found to have cancer, his final concert was on the 23rd of September 1980, in Pittsburgh, Pennsylvania. His condition worsened after this and he died aged 36 on the 11th of May 1981. 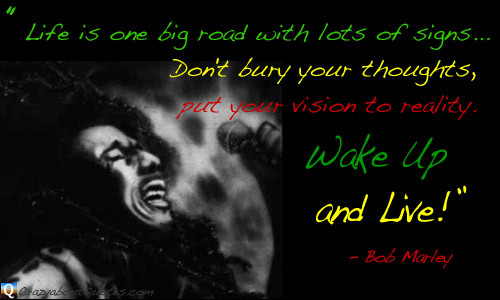 Revered by some as a spiritual figure, Bob Marley the legend and his music has continued to endure through the years. you find someone who can completely turn your world around. a quiet calmness when they are around. they are important to this person who is so special to you. in knowing that they are a part of your life." to affect those around him positively." "Don't worry about a thing, oh no! Cause every little thing gonna be all right!" don't you know that many more are open." "You have to be someone." You just got to find the ones worth suffering for." "Emancipate yourselves from mental slavery. 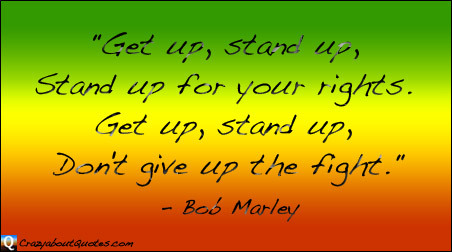 "Get up, stand up, Stand up for your rights. Wisdom Is Better Than Silver Or Gold." are the sad thoughts of tomorrow." "In this bright future you can't forget your past."